Inside Higher Ed reported today on a new survey report on community colleges and challenges that students face. Most community colleges are aware of the challenges students face if they are working, raising children or struggling to afford textbooks. But a newly released survey digs into the nuances of those challenges so colleges can pinpoint ways to lift barriers to college completion and prevent students from dropping out. Researchers at North Carolina State University designed and encouraged students to participate in the Revealing Institutional Strengths and Challenges survey. The survey found that working and paying for expenses were the top two challenges community college students said impeded their academic success. The researchers surveyed nearly 6,000 two-year college students from 10 community colleges in California, Michigan, Nebraska, North Carolina, South Dakota, Texas, Virginia, Wisconsin and Wyoming in fall 2017 and 2018. Of the top ten challenges listed, the category of online classes was tied for fourth along with parking in an ironic twist as lack of physical facilities is one of the drivers for the growth in online education. Interestingly for parking, it is not the costs. 86% of those listing parking stated it was "difficulty finding parking on or near campus" and only 10% listed parking as too expensive. The value of this survey, as described at IHE in interviews with the report authors, is in the nuance that can guide institutional planning. [Report authors] Umbach and Steve Porter, also a professor of higher education at the university, said they noticed a dearth of surveys that asked students about the barriers they face to completing college and wanted to provide a tool that colleges could use to eliminate those barriers and boost graduation rates. On the topic of online education as a barrier, one view of the results could be that only one out of five students have a problem with these classes, which is not problematic as we have long known that online is not for everyone. On the other hand, the nuance provided should give institutions some insight into how they can improve their services to students. The big issue that I've seen in the field is not whether a school should offer online classes - in so many cases this is the only way for students to have access to degrees - but how well-designed the courses are and how much support is provided outside of the course. Throwing courses online with no real interaction or adequate support is a recipe for disaster here, as I described in one case last year. But the school in that example is not alone in this regard. In the many cases where community colleges make these mistakes, students should have difficulty learning and the 21% number should be problematic. But on the opposite side, when colleges focus on improving course design and extend meaningful support services, student outcomes improve dramatically. 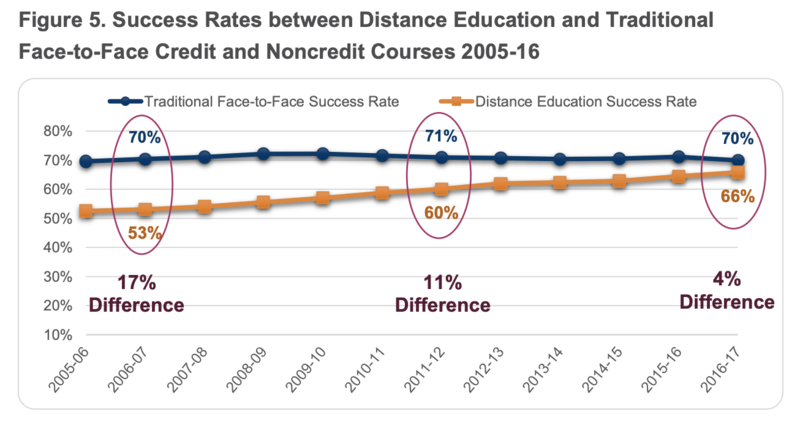 Consider the California Community College system and their improved outcomes, where their most recent distance education report shows system-wide closing of the achievement gap between face-to-face and online students. Online education can work for community college students and is an important part of student access, but there are no silver bullets. I was quoted in the article about these challenges. Hill said the California Community College System's Online Education Initiative, which he worked on as a consultant, is a good example of a well-designed online learning system. It helped close the gap between the rate of students successfully completing traditional courses and online classes from 17 percent in 2006 to 4 percent in 2016. To be clear, the California Community College System in general has been improving their provision and support of online courses for years, and OEI is not the only driver of this change. I don't think the California Community College System is the only example of improvements in online education support, but I do think their focus on improving course design as well as improving advising and support structures is worth considering. The problem of 'difficulty learning material on my own' and 'difficulty keeping up' issues can only partially be addressed - online education is not for everyone - but more engaging and well-designed online courses can help, or at least reduce barriers. The mixing of synchronous elements of a course along with asynchronous can also play an important role. 'Lack of interaction with faculty', 'lack of interaction with other students', and 'difficulty using course technology', however, are issues that should be addressed by the institution as part of the course design and support services. It would be naive to think that these issues could be eliminated, but there is no excuse for schools to not have a coordinated effort to make improvements across all online courses. Online education can work, and community colleges can improve outcomes by addressing the challenges students face. While this post focuses on the online education angle, the whole report is worth reading. The insights into issues outside the classroom, particularly for students trying to balance work and family commitments with their education, should provide valuable input into institutional- and system-level planning. There are some incredible, innovative ideas being presented to improve online course design and student success on the IDEO Innovation Challenge to Reimagine Online Learning or the new California Online Community College 115 to improve online course design and student success. “Welcome! We’re glad you’re here. We’re creating a new kind of online college and we need your help. The California Community Colleges is creating a new kind of online college and we’re inviting you to design it with us. Get started by watching the video above.